Certified Nursing Assistants work under the supervision of a licensed nurse to help patients with the activities of daily living. 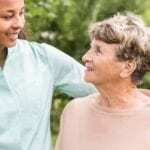 They account for 60 to 70 percent of the nursing staff in long-term care settings and provide as much as 70 percent of the direct care to residents. Their extensive contact with patients allows them to play a key role by keeping nurses and physicians informed on critical changes in patients’ mental, emotional or physical health. With the direction of the licensed nurse, the CNA assumes an active in the care and treatment of patients. The responsibilities of a nurse aide spans a variety of simple to complex tasks including the preparation of meals for patients in their homes, keeping track of fluid intake and output, delivering supplies and specimens, measuring vital signs, feeding patients, assisting with personal care and grooming, and assisting with transfers and ambulation. The nurse aide training program includes a theoretical component to give students an overview of health care and the practice of nursing. A clinical experience included in the program will prepare students to handle difficult situations and work independently with minimal supervision. The nurse aide training program at Danville Community College prepare students to take the Virginia State Board of Nursing CNA test. The school offers the Basic Nurse Aide and Nurse Aide Extended Career Studies Certificates to prepare students for employment in acute and long-term care facilities. The curriculum includes instruction in the classroom and practical sessions in the school’s lab and clinical site. Students enrolled in the Basic Nurse Aide will complete 9 credits while those in the Extended Care will complete 16 credits. Both programs offer CPR certification. The Extended Care covers additional training in First Aid and Safety and Studies in Medication Aide. Course topics include anatomy and physiology, personal care, social, emotional and spiritual needs of patients, orientation, communication and interpersonal relationships, nutrition and feeding, death and dying, safety and infection control, observation, charting and reporting, and transfer and discharge. At the conclusion of the program, students will be able recognize changes in body functioning, measure and record routine vital signs, dressing and toileting, measuring and recording fluid and food intake and output, bathing, grooming and oral hygiene, and positioning and turning. Tuition costs $148.75 per credit hour. The Basic Nursing Assistant program at Medical Solutions Academy provides students with the knowledge and skills to provide high-quality care. The program is available in a day and evening format. The day schedule runs for 3.5 weeks and the evening schedule is 6 weeks. Day classes meet Monday through Friday from 9:00 am to 3:30 pm. The evening class meets from Monday through Thursday from 5:00 pm to 10:00 pm. The entire curriculum is 120 hours. Graduates are prepared to sit the Virginia Certified Nursing Exam to work in health care. Applicants must be 18 years or older, be a US citizen, submit to a background check, and complete a PPD (TB) test. Tuition costs $695 and includes the enrollment fee, uniform, textbook rental, and badge. A payment plan is available for all students. Additional costs include the state competency fee, textbook (optional), and background check. Centra Health prepares students for the National Nurse Aide Assessment Program (NNAAP) State Certification Examination in just six weeks. Students who pass the exam will become a Certified Nursing Assistant. The program is approved by the Virginia Board of Nursing and includes instruction in the classroom and lab plus a supervised clinical in a skilled nursing facility. Course topics include vital signs, range of motion, personal care skills, safety and emergency procedures, positioning and transfers, basic nursing skills, restorative services, patient rights and dignity, death and dying, nutrition and feeding, infection control, and mental health. Applicants must have a high school diploma or GED, provide three personal references, and a completed application. A background check and drug is also required for admission. Tuition costs $800 plus additional for the background check and drug screen. Additional expenses include uniform, shoes, a watch with a second hand, and manual blood pressure cuff and stethoscope. Centra will waive the tuition and other fees for students who commit to working at Centra for at least one year. Students who successfully complete the Nurse Aide Course at Southside Virginia Community College will be prepared to take the state certification exam to become a Certified Nursing Assistant. The program is offered through the school’s Center for Workforce Development and is available year round on a day or evening schedule. Graduates can qualify for entry-level employment in nursing homes, hospitals, and home health agencies. They can also use the training as a first step to becoming a licensed nurse. The curriculum includes theory and practical instruction in observation and reporting, vital signs, basic nursing, mental health, position and turning, fluid and food intake and output, infection control, personal hygiene, and rehabilitation and restorative treatments. The program may be completed in 6 to 8 weeks. Tuition for the program costs $2,216. Books and supplies cost an additional $1,061.